After the long holidays, festive biryani’s and high calorie foods, today I am sharing a simple curd rice that too prepared with millets, undoubtedly a perfect and healthy combo. 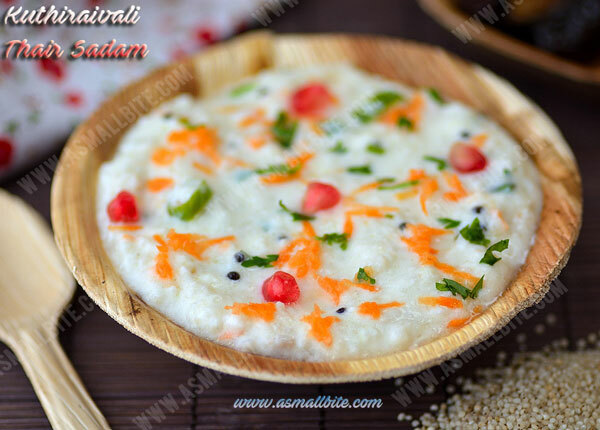 Curd rice is always a tummy friendly dish, which soothes our stomach during summer and even after a heavy feast. This barnyard millet is known as Kuthiraivali in Tamil, Jhangora in Hindi and Oodalu in Kannada. It is high in fibre, good for diabetic patients, has low carbohydrate content which helps to accelerate weight loss. 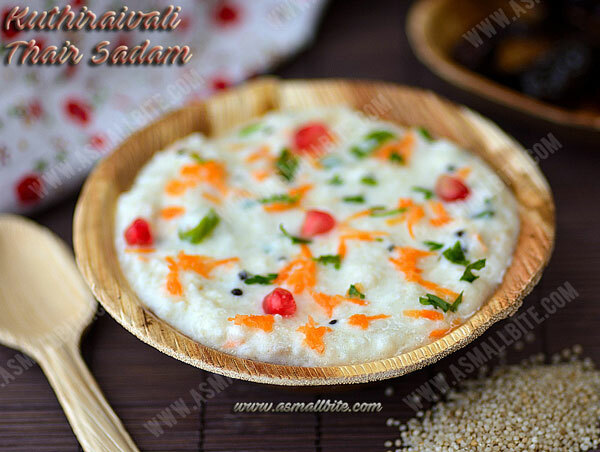 Do try this Millet curd rice / Barnyard millet curd rice / Kuthiraivali thayir sadam recipe for a healthy life style. 1. Rinse the millet well and soak in water for 10 minutes. By the time measure milk, curd and keep by side. Chop ginger, green chilli finely and grate carrot. 2. After 10 minutes drain the water. Pour 1.5 cup of water in a pressure cooker and add the millet. Pressure cook for 3 whistles. Once the pressure subsides, transfer the cooked millet to a wide bowl and allow it to cool. 3. Now pour curd, milk, required salt and mash a little. 4. Heat a small pan with oil, add mustard seeds and let it splutter. Then add urad dal, ginger, green chilli, curry leaves and hing. 5. 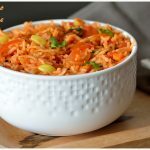 Switch off flame and add grated carrot. Pour the tempered items over the curd rice. If preferred add pomegranate / black grapes and mix everything well. 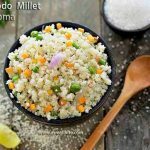 Serve this millet curd rice with potato pepper fry. 1. Soaking the millet in water helps in easy cooking. 2. This barnyard millet can be replaced with kodo millet, little millet, pearl millet etc. 3. Don’t use sour curd, always use fresh and thick curd. 4. For restaurant touch, 2 tsp of butter can be added along with milk. 5. 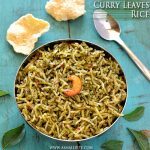 Don’t skip milk as it prevents this barnyard millet curd rice turning sour. 6. For different taste even cashew, raisins can be fried in ghee and added at last. 7. 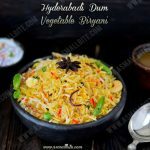 Veggies like shallots, cucumber, raw mango etc can also be used. 8. Fruits like grapes, black grapes, pomegranate can be added for little sweet taste. 9. Green chilli can be replaced with curd chilli / mor milagai while tempering which adds more flavour. 10. 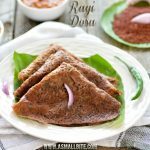 This kuthiraivali thayir sadam recipe thickens with time, add milk or curd accordingly. 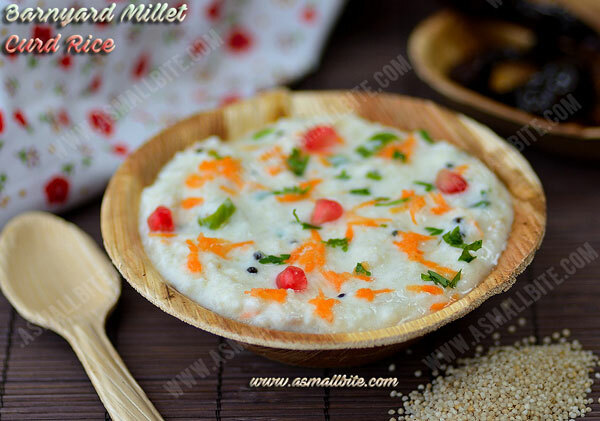 It’s been a long while since I had this millet curd rice.. beautiful pics and a healthy recipe ?